The acclaimed exhibition Decolonizing Appearance at Trampoline House’s art space CAMP / Center of Art on Migration Politics has been extended until March 30, 2019. The exhibit is guest curated by visual culture theorist Nicholas Mirzoeff and examines what appearance is, how appearance is used to classify, separate, and rule human beings on a hierarchical scale, and how we can challenge this regime. It brings together some of contemporary art’s most engaged individuals and collectives from across the globe: John Akomfrah, Jeannette Ehlers, Forensic Architecture, Dread Scott, and many more. Admission to the exhibition DKK 40. Free guided tours every Saturday from 3–4 pm (last Sat. of the month closed). Click here to read more. Since November 2018, children and parents living in deportation center Sjælsmark have initiated a series of demonstrations in the fight for better conditions for the children of Sjælsmark. On Tuesday, Jan. 15, the children and parents are inviting the public to join the fifth demonstration, which will meet at Rådhuspladsen at 3 pm and move to Amnesty International at Gl. Torv in Copenhagen. When & where: Tues., Jan. 15, 3–5 pm, Rådhuspladsen and Gl. Torv, 1457 København K.
On Sat., Jan. 19 from 4–11 pm, activists inside and outside deportation center Sjælsmark invite you to a community afternoon and dinner in Folkets Hus, Stengade 50, 2200 Copenhagen N. There will be babysitting and activities for children. Suggested donation for dinner: DKK 100-200. Please register at outofcampdinner@gmail.com. Trampoline House is proud to announce that from this week onwards the association Vores Asylbørn (Our Asylum Children) will offer counseling to refugee children and youth in Trampoline House every Thursday from 4–7 pm. 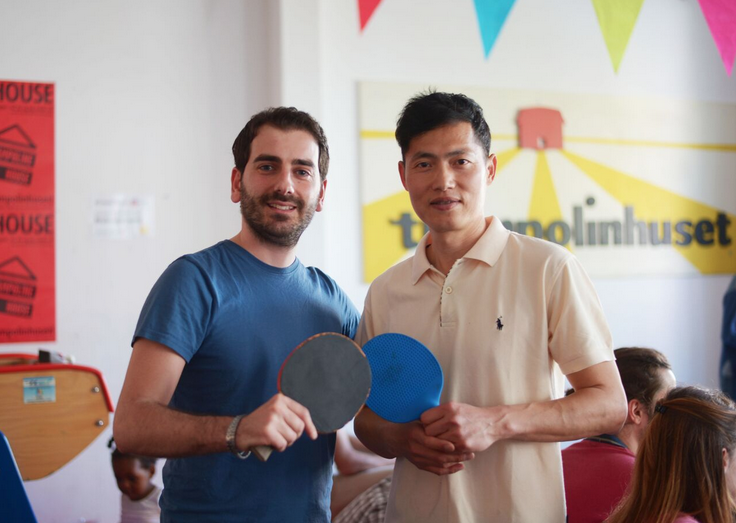 The ping pong workshop with David has stopped as he got asylum and is busy with the integration program. We thank him for his effort in Trampoline House and wish him good luck.